This page is dedicated to videos that shows Cone Shells hunting habbits. 01 january 2019 : !! HAPPY NEW YEAR 2019 !! A new video have been published at WWS : Shell Books Review : New Caledonia & Mayotte Shell books ! 24 december 2018 : !! MERRY CHRISTMAS !! A new video have been published at WWS : Shell Books Review ! 6 Books about sea shells today ! I wanted to announce the imminent publication of my book on Seychelles cones. Two versions will be published in January 2019: a French and an English version. This is the result of a year and a half of work. This is a 173-page guide that will delight the beginner but also the specialist. 70 plates representing 278 specimens are presented to you. The book is in A5 format. It is easy to take on vacation. Of course, this book can be used throughout the Indian Ocean because most of the species is found throughout this geographical area! The texts are numerous (one for each species). Part is dedicated to certain identification keys for beginners. If this book interests you, it is offered at a reduced price of € 29 for pre-orders (*) of this first draw (excluding shipping costs). For French readers, it will be possible to withdraw it on the Stock Exchange to get it back on the Toulon-La Garde Stock Exchange in February 2019. For any pre-order please send me an email to david.touitou83@gmail.com. (*) the pre-orders will end on 31-01-2019. 23 march 2018 : The iconography of the Polynesian coneshells have been updated with 4 images of Conus eldredi. 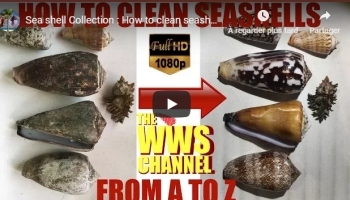 22 march 2018 : Two new videos about storing seashells ! 18 march 2018 : The iconography of the Polynesian coneshells have been updated with the last described specie : Conus easoni. 23 january 2018 : best wishes for 2018 !! And hope you'll enjoy this new video about Maldives ! 11 august 2017 : More images have been uploaded into the Maldives' article ! 21 may 2017 : Seychelles iconography : CONIDAE = updated with 6 new imges. 28 march 2017 : A new article have been published about Michel Balleton's 3 new books ! 06 January 2017 : !! Happy New Year 2017 !! 26 December 2016 : The http://www.seashell-collector.com/beginners/page_storing.html (STORING SEASHELLS PAGE) have been updated with a list of trees-wood acidity to avoid the acid action on your shells in wood cabinet. 24 December 2016 : The galleries are down and will be restored as soon as possible. 19 December 2016 : The website have been partially hacked in december. We had to load a older version fo files. News since february have been lost but files shall not have been touched by this attack. Thanks to Laurent, the website is online again ! MERRY CHRISTMAS TO ALL and HAPPY SHELLING !! 23 Feb. 2016 : The Author's Collection have been updated : this concerns the Seychelles collection (updated at 80%), more images to come. 01 January 2016 : !! HAPPY NEW YEAR 2016 !! AND HAPPY SHELLING !! 03 January 2015 : !!! Happy New Year 2015 !!! Seashell-Collector was at SANIBEL for christmas !! Awesom Low Tide and what a nice island ! 27 november 2014 : Forum spamming problems seem to blocked now, registering and reseting password shall work properly. 21 october 2014 : !!! IMPORTANT !!! Databases are actually closed in order to upload and test the new version (worldwide collectors, live seashells,...). 10 october 2014 : We still have a lot of spammers trying to log in our forum and everyday this blocks our mail account. Tou may not received the confirmation mail. Please contact us. 12 september 2014 : One may now register at seashell-collector.com again, except that you need to contact me in order to receive your password. 11 September 2014 : IMPOSSIBLE TO REGISTER ON OUR FORUM actually !! Dear users, We have applied the last update to our forum (MyBB regular update) and this causes a problem while users want to register our forum. Usually you cannot and the forum tells you that you IP adress is detecting as a spamming one. If you need to register, please contact me at pharma.collo@gmail.com and I will create your account manually. 27 June 2014 : TCC25 have been published, you may read it there : http://www.seashell-collector.com/miscellaneous/page_theconecollector.html ;2 articles from seahsell-collecor.com have been published in this newsletter. 23 April 2014 : I have finished the review of my old article from 2002 about Seychelles Cowries. You may check it in the ICONOGRAPHY menu. 19 March 2014 : Laurent have corrected the World Wide Collectors display bug and the system is working fine actually. 14 janaury 2014 : The third version of Polynesian CONIDAE have been published in ICONOGRAPHY folder. 09 janaury 2014 : The third version of Polynesian CONIDAE is about to be published. 01 january 2014 : HAPPY NEW YEAR 2014 and Happy Shelling !!!!!!!!!!!!!!!!!!!!!!!!!!!!!!!!!!!!!!!!!!!! 24 december 2013 : MERRY CHRISTMAS !!!!!!!!! Hope shelling will be in all mind with the upcoming year !!!! Actually we are still working on the CONIDAE from Martinique & Guadeloupe (Caribbean) which is very difficult. Hope ti be able to make soon the revision of Polynesian TEREBRIDAE. And welcome to our 2 historical sponsors : CONCHOLOGY & SHELLSPASSION. 06 december 2013 : I am actually working on the revision of the CONIDAE from Martinique & Guadeloupe (Caribbean). The first work was really out of date... 2005 ! 19 november 2013 : I have finished the revision of the CONIDAE from Seychelles. I updated the iconography with bigger images. I tried to fit with the scale of shells to show properly the big ones and very small ones. 17 october 2013 : I am actually working on 3 projets : Updating our 2004 work on French Polynesian Conidae Checklist with the help of Michel Balleton. We are actually working with Norbert Verneau on the iconography of Mayotte (Indian Ocean) Cone shells and I am abour starting a similar project (Conidae checklist) with someone from Mauritius (Indian ocean). 13 october 2013 : As several of you asked me the creation date of website... We created this website in 1997 ! As you can notice, rare are the websites (from all kind of hobbies) that still exist from that period. I have seen hundreds of shell related websites that have been created and deleted... that is the main problem with internet. Things never go on for a long period. I just used a programm to check broken links. I had to delete hundreds of links to external pages !! 11 october 2013 : I have changed the banner, I hope you will appreciate this big banner showing a diver (me) face to a nice Cypraea Luria lurida lurida from France ! 10 october 2013 : Sum up of genral articles have been corrected, display bug in the list. 23 may 2013 : Dear members, we had to change the forum as the old one was hacked too often. We of course kept all messages and accounts, but it could ask you a new password. Two days shelling at Sanibel !